When a relatively unequal competitor is about to overtake a dominant competitor, lawfare is most likely to break out when the less dominant competitor perceives their opportunity to replace that hegemon. At this point in the power relationship, the less dominant competitor may seek interlocking relationships with other less dominant competitors in the relevant market in order to attack the hegemon by reducing competition with each other and coordinating lawfare operations against the hegemon. These interlocking boards or corporate relationships may work well when there is something in it for the allied less dominant competitors that helps each of them in ways that do not harm each of them. For example, in an alliance of two less dominant competitors G and S against hegemon A, this will be particularly true if company G has discrete goals with hegemon A that only tangentially affect company S. If lawfare against hegemon A would greatly benefit company G and would not harm company S, S may find an alliance with G for lawfare against A to be beneficial. In the world of corporate realpolitik, such alliances may form well in advance of an anticipated move by A that threatens both S and G.
These numbers suggest that while Spotify may have a significant share of overall U.S. recorded music revenue, Spotify is clearly dominant in the global subscription market with its now 20 million subscribers and probably is dominant in the U.S. music subscription market. Yet it is Spotify’s failure to convert users of the Spotify ad supported service (with ads served by Google) to the Spotify subscription service that is at the heart of objections to continuing to license the ad supported service. Not to mention the bait and switch aspect. The move is a fascinating one, especially since sources inside Google said that new YouTube head Susan Wojcicki has expressed interest in acquiring the popular online music service if it were for sale. It is not currently and there are no such discussions going on between the pair about such a transaction. Thus, the new appointments appear unrelated. And, to be clear, Google’s top execs often join boards of companies, both with corporate ties to them and not. In any case, Google is still planning on launching a long-delayed YouTube subscription music service this year that would compete with Spotify. If it actually does get going, it will be the second such offering from the company. That YouTube subscription service is now even longer delayed. In fact, I’m beginning to wonder if it will launch at all. …Spotify co-founder and CEO Daniel Ek has indeed met with Google execs about various and substantive commercial deals at YouTube, Google Play and Android. As Re/code previously reported it would do, Spotify has officially added Google’s business head, Omid Kordenstani, to its board. And thus the interlocking alliance was formed. Recall for a moment that the Federal Trade Commission pressured Google Executive Chairman (and then-CEO) Eric Schmidt to resign from the Apple board of directors. This after Google launched a series of products that directly compete with Apple and is so coincidental as to call into question whether Schmidt violated his fiduciary duty as an Apple director (Droid, Google Tablet, AdMob, Google TV, and what was then called Google Music). The U.S. Federal Trade Commission said it will continue to investigate the relationship between the boards of Apple Inc and Google Inc, after Google’s chief quit Apple’s board on Monday. Richard Feinstein, director of the FTC’s bureau of competition, commended both companies for recognizing that sharing directors raises competitive issues, in light of the resignation of Google Chief Executive Eric Schmidt from Apple’s board. Feinstein said regulators have been investigating the Google-Apple tie for “some time,” even as the two companies increasingly compete with each other in markets such as smartphones and operating systems. “We will continue to investigate remaining interlocking directorates between the companies [for violations of the Clayton Act],” Feinstein said. Well, that 2009 investigation seems to have trailed off and gone nowhere. 2009, 2009, what else happened in 2009? It can safely be said that Google’s war on Apple is long standing and there is no love lost there. It should not come as a surprise that Spotify would view Google as a valuable ally in its own competition with Apple. Not only was Spotify’s dominant position in the music subscription market directly threatened by the launch of Apple Music, but Apple’s gifted executive Eddie Cue delivered further humiliation to Daniel Ek involving Ek’s bête noire, Taylor Swift. Artist relations problems need to be solved quickly and generously (and frankly if an issue get to become an artist relations problem, it’s your own damn fault). Mr. Cue quickly solved an artist relations problem around Apple’s proposed 90 day royalty free launch by his deft handling of criticism from Taylor. Mr. Cue’s successful handling of Taylor’s criticism solved his company’s artist relations problem. Whether Mr. Ek knows it or not, this was a further humiliation to him after Spotify’s brand damage from his widely-reported collision with the Taylor juggernaut. In September 2014, Spotify announced a hire that was largely overlooked at the time. Taking “hackathon” to a whole new level, Spotify announced that it had hired Washington lobbyist and Clintonista Jonathan M. Prince as its corporate communications revolving doorman. Now why do you suppose this person was brought on? I seriously doubt that these relatively simultaneous statements by Lucian and Doug came as a total surprise to either Spotify or Google, but the public nature of the statements combined with personnel changes probably put a fine edge on reality for Spotify and Google. Lawfare was now in order. Not only did Spotify and Google have interlocking interests in preserving the ad supported model, but each brought complimentary skill sets to the lawfare ready room. Spotify is able to play the role of plucky startup victimized by the big bad Apple and the smaller but badder major labels that are conspiring to take free music away from consumers. Google is able to hang out in the shadows and bring its investment in Washington, DC agency capture and vast experience being on the wrong end of antitrust investigations around the world. And in particular, Google’s stunning influence over the U.S. government through the Obama Administration including the Federal Trade Commission. Counselor to the Chairman, Federal Communications Commission: Gigi Sohn, formerly CEO of Google Shill Lister Public Knowledge. Chief Digital Officer, Office of Management and Budget and Featured Revolver at OpenSecrets.org‘s Revolving Door Site: Jason Goldman, formerly Product Manager at Google. Director of Google Ideas (and co-author with Uncle Sugar of The New Digital Age): Jared Cohen (formerly a member of the Secretary of State’s Policy Planning Staff and as an advisor to Condoleezza Rice and later Hillary Clinton). And then there are dozens if not hundreds of former Hill staffers now working for Google’s DC shillery. Not to mention FTC Commissioners Joshua Wright and Edith Ramirez, Julie Brill and Maureen K. Ohlhausen. The investigation centers on whether Apple may have urged [Sony and Universal] to drop support for free, ad-supported streaming services such as Spotify and Google’s YouTube. Such a move could be seen as anti-competitive. That investigation was later dropped by the New York AG (who also signed the amicus brief supporting Mississippi Attorney General Jim Hood against Google). Why was it dropped? Well, possibly because there are solid commercial reasons for deciding that the experiment with ad supported music was a disaster? Possibly because it became apparent that Spotify’s story about converting free users to subscribers was not borne out by the…you know…results? How do you suppose that this investigation got started? Just a coincidence? Guess what also happened right around the same time? 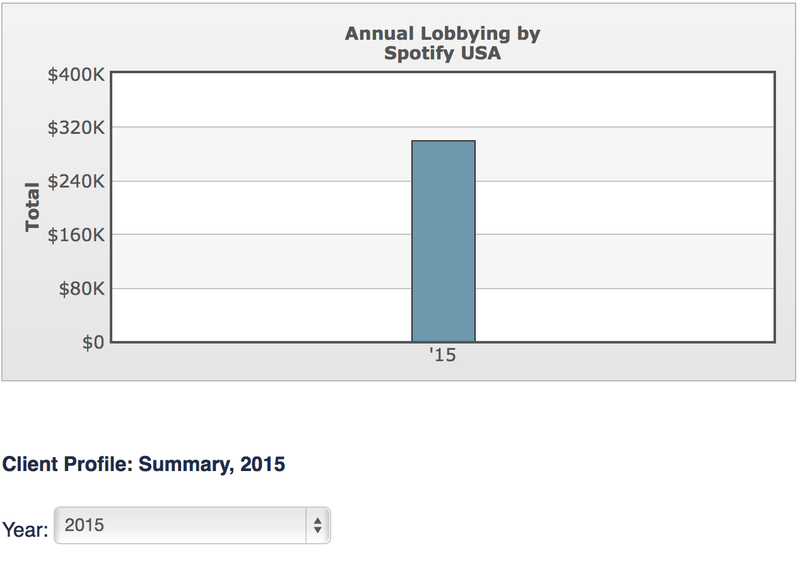 Yes, those Washington lobbyists don’t have to use a scientific calculator to add up what Spotify pays them! The NY complaint was a skirmish before the main attack. And here’s where the real lawfare gets interesting. Remember, Google has been fighting Apple for years and Eric Schmidt left the Apple board under a cloud (no pun intended). Independently of Spotify, I think it’s pretty safe to say that if Google could find a way to jack with Apple they would jump on it. Also remember that Google has been bashing apps for quite a while and it takes no great genius to suspect that the reason is because they can’t stalk you inside of apps very easily. So if Google could find a way to attack Apple’s apps, don’t you think they’d jump on it? Of course if Google itself went after Apple’s App Store pricing that might be a little transparent, so that won’t do. What to do, oh what to do? Spotify has sent an email to Apple iOS subscribers, suggesting they cancel their Spotify Premium accounts, if those subscriptions were purchased through the Spotify app, and re-subscribe on Spotify’s website. The reason for this surprisingly suggested workaround is to save money. A Spotify Premium plan costs $13 when purchased through iTunes, and $10 when bought directly from Spotify. “The normal Premium price is only $9.99, but Apple charges 30 percent on all payments made through iTunes,” Spotify said in the subscriber email acquired by Engadget. As RAIN confirmed, Apple has nothing to do with setting the price for in-app purchases. That decision lies with the developer exclusively. The developer–Spotify in this case–knows going in what the cost will be. Spotify knew that when it first put the Spotify app in the App Store years ago. The timing of Spotify’s communication, soon after Apple’s launch of a competing on-demand music service, cannot be ignored. It must be particularly galling to Spotify that Apple is potentially luring users to its own service, and taking a portion of Spotify subscription payments. The risk of Spotify’s communication strategy is that subscribers will cancel their Spotify/iTunes subscriptions, as Spotify recommends, and sign up for Apple Music’s three-month trial. The advice here, for what it’s worth, is for Spotify to drop the in-app subscription price to $10, eat the loss, hand the saving to subscribers, and retain its users. Complaining isn’t aggressive business. Pricing is. There is, of course, a long way from “galling” to “illegal.” And that’s what lawfare is all about. So it should come as no surprise that the Federal Trade Commission is now investigating Apple for deceptive trade practices. What is so tough for regulators here — other than that they are using relatively arcane laws that probably never anticipated the innovation now going on in the tech sector — is that the streaming companies really do have a lot of ways to reach consumers. They can sell it over the Internet. And they all offer apps on Google’s store, which actually serves more customers around the world than Apple does. So is Apple’s behavior truly anti-competitive? Actually–the fundamental question is whether Google is manipulating the Federal Trade Commission to conduct lawfare against Apple to preserve the shite artist royalties from ad supported services like YouTube and its interlocking relationship partner Spotify. This is not just a Nixonian fantasy. Two days after the email was sent, and after the Wall Street Journal published another article about Google’s relationship with Washington, the FTC released a statement that provided the context Shelton had sought. In other words, Google lobbyists said jump and the FTC’s political appointees merely asked how high. Is Google pulling rank to get the FTC to investigate Apple on a pricing policy that has been in place for years? Is Google using its interlocking board seat with Spotify to use Spotify’s competition with Apple in the music subscription market to get the FTC to attack Apple in a way that also benefits Google in the smartphone market? Of course now that Spotify has Jonathan Prince on board, the company may be able to use Prince’s easy access to senior White House staff to sick the FTC on Apple all by themselves. But either way, the motives are oddly aligned. However–Digital Music News tells us that Apple Music to date has had no effect on Apple App Store downloads of the Spotify, Pandora or YouTube iOS apps. I wonder what the FTC thinks of that stat? Let’s remember that Spotify is a music service. It’s not in as many business lines as Google. The only reason why Spotify is able to spend hundreds of thousands on lobbying (probably soon to be millions at this run rate) is because they get cheap deals on music. Those deals have an end point. The most meaningful statistic of all, though, is the number of subscribers to Apple Music. Apple reached 10 million subscribers in about 45 days. Spotify reached 20 million subscribers in seven years. If Apple Music continues on anything like this run rate, it is going to be very difficult for company S to overtake hegemon A. Apple Music provides market confirmation that free music is not necessary to get users to subscribe to a music service. And that is not good for company G or company S. Not to mention that lawfare can backfire. What they have to worry about is that in their effort to stop Apple by manipulating the FTC, Google and Spotify will have demonstrated that something is really rotten in Washington, DC. And Mountain View. Not to mention Sweden. The idea of Google investing in original content is amusing. Can you see chillingeffects hosting DMCA notices from Google as their premium content gets pirated across the web? Most likely they’ll just silently remove the links from their search results without anyone asking.